On Monday, the U.S. Food and Drug Administration issued its strongest condemnation of teen vaping yet, following the release of new data from the Centers of Disease Control and Prevention. According to the CDC, one in five high-schoolers took up vaping in 2018, a significant jump from 2017. FDA chief Scott Gottlieb went as far as to call teen vaping one of the agency's "biggest public health challenges." Last November, the CDC released preliminary data from the survey, which estimated that over 3.6 million kids used e-cigarette products at least once in the past 30 days during 2018. That's 1.5 million more kids than are thought to have done the same in 2017. On Monday, the CDC released a new report that puts the teen vaping trend against the backdrop of overall tobacco use. E-cigarettes are considered a tobacco product by the CDC and FDA, despite the fact that there is no actual tobacco in them. That said, the nicotine usually vaped in these products is derived from the tobacco plant, though not from the same kind of tobacco smokers light up (and there's at least one company that's trying to make synthetic, tobacco-free nicotine a thing). By the CDC's definition then, there were 4.9 million young users of tobacco products in 2018. More than one in four high schoolers (27 percent) used tobacco products, while one in 14 middle schoolers (7.2 percent) did the same. Among high schoolers, that represents a 38 percent jump from 2017, entirely due to e-cigarettes-nearly 21 percent of high schoolers have vaped in 2018. It's tough to say how many of these users are regular vapers, as opposed to someone who just experimented in the past month. But according to the CDC, the percentage of those who have frequently used e-cigarettes (defined as vaping at least 20 of the past 30 days) also climbed in 2018, from 20 percent of users to 28 percent. While vaping is likely less harmful than traditional cigarette smoking, the FDA and some (but not all) research has suggested that teens who vape are more likely to eventually switch to tobacco cigarettes, including some who would have never smoked in the first place. If this switch happened on a large-enough scale, tobacco experts have worried, it would slow or even reverse a steady decline in smoking rates-undoubtedly one of the country's major public health victories. "We must stop the trends of youth e-cigarette use from continuing to build and will take whatever action is necessary to ensure these kids do not become future smokers," said Gottlieb in a statement. Last November, in conjunction with the CDC's release of teen vaping data, the FDA announced that it would pursue heavy restrictions, but not an outright ban, on flavored e-cigarette products sold in stores. Juul Labs, whose trendy, nicotine-rich products have been singled out as being particularly enticing to teens, preempted the FDA's response by announcing they would pull most of their flavored products off physical store shelves. The FDA has not stopped there , though. Last week, it initiated an enforcement action against two Walmart and Circle K stores for selling tobacco products to minors (if the actions go through, it would bar the stores from selling any tobacco for 30 days). The agency has also put Walgreens on notice, with Gottlieb saying he would seek to arrange a meeting with the retail chain to discuss its repeated violations on selling tobacco products to minors. Gottlieb also criticized Juul by name recently for not doing enough to address teen vaping, especially in light of its $ 13 billion deal with tobacco giant Altria last year that gave the company a 35 percent share in Juul's stakes. The new CDC report provides a sharp contrast to a large study in the UK published just last month, which found that e-cigarettes-in conjunction with behavioral counseling-could help smokers quit more effectively than traditional treatments like the nicotine patch or gum. 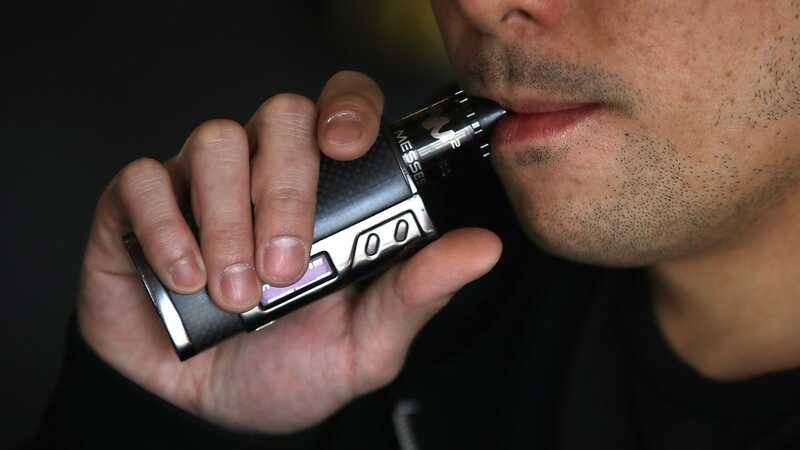 While Gottlieb did assert that e-cigarettes can still play a role in driving down smoking rates, he also reiterated that the agency "will not allow that opportunity to come at the expense of addicting a whole new generation of kids to nicotine. We must close the on-ramp of nicotine addiction for kids even if it risks narrowing the off-ramp from smoking for adults. "